Transparency Market Research has released a new market report titled “Fifth Wheel Coupling Market (Mounting Type: Fixed and Sliding; Coupling Type: Compensating Coupling, Semi-oscillating Coupling, and Fully Oscillating Coupling; Material: Steel, Aluminum, and Other; Operation: Mechanical, Hydraulic, Pneumatic; Load Carrying Capacity: Less Than 20 Tons, 20 – 30 Tons, 30 – 45 Tons, and Others; Number of Pins: Single Pin and Double Pin; Application: Light Duty Application, Medium Duty Application, Heavy Duty Application; Sales Channel: OEM and Aftermarket; and Region: North America, Europe, Asia Pacific, Latin America, and Middle East & Africa) - Global Industry Analysis, Size, Share, Growth, Trends, and Forecast, 2019–2027.” According to the report, in terms of revenue, the global fifth wheel coupling market is estimated to expand at a CAGR of about 4 % during the forecast period. Fifth wheel couplings are a cost-effective and reliable component that provide proper coupling between semi-trailers and tractors, pick-up trucks and recreational vehicles, and trucks & tankers. Fifth wheel couplings are mounted at the rear end of the vehicle, such that over the last axle of tractor, truck, and pick-up truck. Semi-trailer or trolleys are attached to the fifth wheel coupling by means of kingpin that is inserted in the fifth wheel coupling. Therefore, demand for fifth wheel couplings is rising along with the rise in demand for semi-trailers and heavy duty trucks, which is attributed to increase in trade volume due to rise in industrialization and development of road infrastructure across the globe. Moreover, implementation of government norms have led to an increase in the allowable length of medium and heavy duty vehicles in order to curb emission by enhancing vehicle load carrying capacity, which in turn is estimated to fuel the demand for semi-trucks and trailers. Sliding fifth wheel couplings are capable of compensating variation in length of semi-trailers or trolleys being attached to them. The sliding fifth wheel coupling allows the user to vary load distribution on the towing tractor or truck, and hence, demand for this coupling is rising among consumers. Moreover, consumer preference for sliding fifth wheel couplings is also attributed to reselling and aftermarket. However, fixed fifth wheel couplings provide a highly rigid coupling between the tractor and semi-trailer, which is capable of handling heavy loads. Moreover, it is less expensive than the sliding fifth wheel coupling and hence, fixed fifth wheel couplings are highly preferred by consumers and fleet operators. Consequently, the fixed segment accounted for a major share of the market, in terms of revenue, in 2018. Semi-oscillating type of couplings are highly suitable for trucks and trailers, primarily operating over well-maintained road surfaces. Semi-oscillating couplings are being highly preferred, as most trucks and trailers operate across well-developed road infrastructure. Moreover, semi-oscillating couplings are less expensive than the other types of fifth wheel couplings. Therefore, the semi-oscillating coupling segment held a notable share of the market, in terms of revenue, in 2018. Steel is a highly preferred material to manufacture fifth wheel couplings. Steel possesses extreme corrosion and wear resistance, and is less likely to bend or deform under varying loads and force. Moreover, it is comparatively less expensive than aluminum and cast iron. Therefore, the steel segment accounted for a prominent share of the market, in terms of revenue, in 2018. In terms of operation, the global fifth wheel coupling market has been segregated into mechanical, hydraulic, and pneumatic segments. Mechanical systems are less complicated, in terms of design, and have significantly lower weight. Therefore, mechanically operated fifth wheel couplings are highly preferred by consumers and OEMs. A hydraulic or pneumatic system is preferred for several sophisticated applications, where consumer demands ease of locking and unlocking the fifth wheel coupling. Heavy duty vehicles, long haul trucks, and road trains prefer fifth wheel couplings in order to enhance vehicle maneuverability across sharp turns & stiff roads. Demand for heavy duty vehicles, such as those having a capacity of more than 30 tons, is likely to rise significantly in the near future owing to a surge in demand for road trains. Therefore, above 30 tons capacity segments are expected to expand at a considerable CAGR between 2019 and 2027. Single pin fifth wheel couplings are capable of handling significantly higher loads and hence, are utilized in a majority of applications. Consequently, the single pin segment accounted for a notable share of the market, in terms of revenue, in 2018. Double pin fifth wheel couplings are utilized in select applications, where the loads are extremely high. Heavy duty vehicles, such as vehicles deployed on off-road conditions, prefer fifth wheel couplings in order to handle the varying center of gravity of the trailer. Generally, medium and heavy duty trucks and tractors have a longer length as compared to conventional trucks and tractors, which poses a challenge while navigating sharp turns and bends. Governing bodies across several countries have increased the legal length of freight transporting vehicles, which is aimed at enhancing the load carrying capacity of individual vehicles. Several heavy duty truck and tractor manufacturers provide fifth wheel couplings as standard on their vehicles in order to enhance performance of their vehicles. Moreover, several consumers prefer OEM installed fifth wheel couplings, as OEMs provide proper fifth wheel couplings according to end-use application and hence, the OEM segment is projected to account for a prominent share of the market during the forecast period. 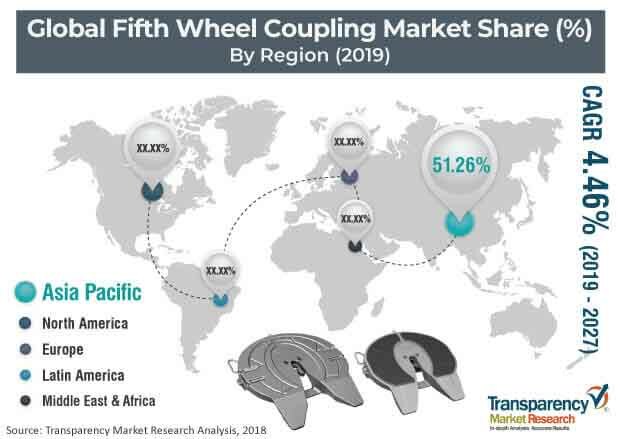 Asia Pacific accounted for major share of the global fifth wheel coupling market, in terms of revenue, in 2018, which is primarily attributed to the deployment of a large number of medium and heavy duty vehicles across China. China is the second-largest trading country globally. Therefore, a large volume of consumer and industrial goods are being transported across the country. China has a prominent automotive manufacturing industry, which demands for a reliable and faster transportation system. This fuels the demand for long haul trucks and tractor trailers, which in turn drives the demand for fifth wheel couplings. Moreover, demand for semi-trailers, road trains, and long hauling trucks is rising in several other countries across Asia Pacific, such as India, Japan, and Australia, which in turn is driving the fifth wheel coupling market across the region. Asia Pacific is followed by North America, where the demand for medium and heavy duty vehicles and long road trains has increased due to the prominent oil & gas and mining industries in the region.